Why you should sell Sunway REIT when it starts to rally on July 8 (listing day)? Jeffrey Cheah is selling his stake in Sunway REIT to "shift his focus" away from Malaysia, which FDI is dwindling at worrying rate. He knows that the Malaysian economy is going down the drain sooner or later.If it's so good,why sell it to the public?More shopping centres will flood the market in the next 2 years but the prospectus never mentioned it. 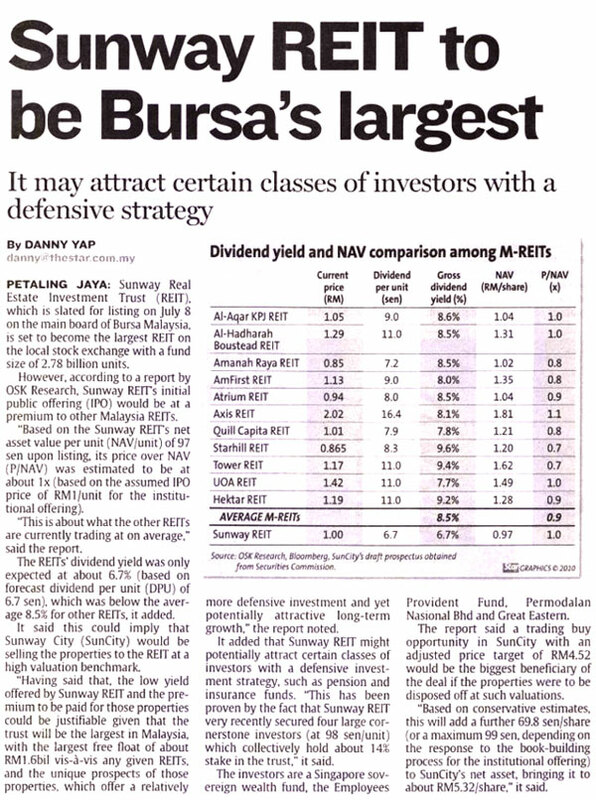 Dividend rate is so low at 6.7% compared to other Malaysian REITs.Average dividend by other REITs is at 8.5%. Hence,the share price will normalise (drop) to follow the other Malaysian REITs. Remember to sell it on July 8. Sunway REIT have very large space in Sunway/USJ. Where is Sunway located? It is a suburban satelite city far away from KL city centre. So,yield at 6.7% is not justified at all.Give me a yield of 10% and I may consider it. What is the future expansion plan of Sunway REIT?What Sunway REIT is gonna buy to increase its NAV ? If the NAV is appreciating at inflation rate while the buildings are depreciating at even faster rate,the dividend yield may be affected due to high repair and maintainence cost. 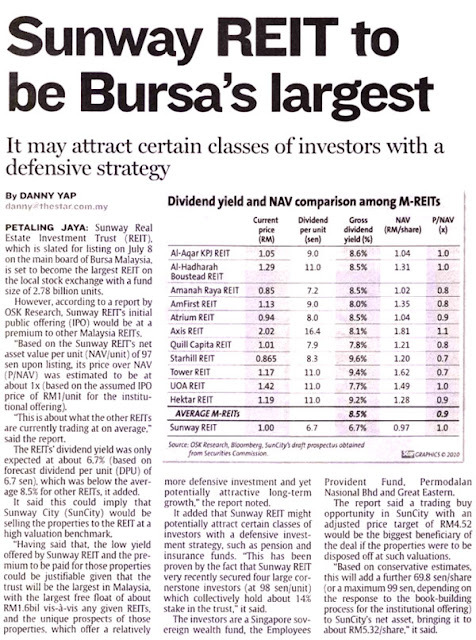 Why bother to buy Sunway REIT?I rather buy KLCC Property Holdings which is more secured and expanding. SUNWAY Real Estate Investment Trust is the biggest ripped off IPO in Southeast Asia this year.